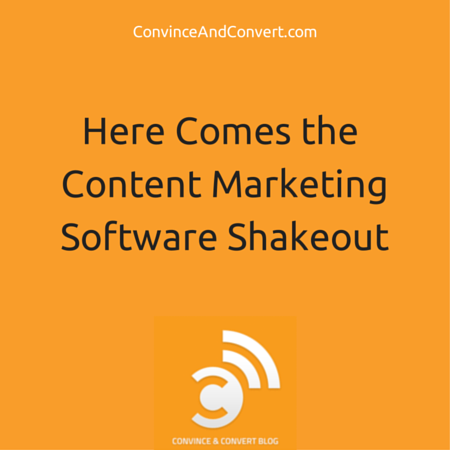 The tick tock until the big content marketing software shakeup is under way. At last year’s Content Marketing World event, I met with multiple venture capitalists hungry to get a piece of the seemingly explosive market for content marketing software, a bucket into which I place all curation, production, governance, promotion and efficiency wares. And in the intervening 12 months, they certainly got their piece. The most striking feature of Content Marketing World 2014, beyond how well-run the event continues to be, was the massively expanded vendor and expo area. Dozens upon dozens of content marketing software companies were cheerily giving demos and handing out freebies alongside enterprise software stacks SAP and Oracle (a Convince & Convert client), and many other firms that are trying to enter the content marketing orbit, such as influencer marketplace TapInfluence (a sponsor of this blog), and competitive metrics analyzer Track Maven. Many more software companies and agencies attended without exhibiting, trolling the hallway and parties for leads and potential partnerships. While the content marketing industry is perhaps still fully in the throes of the awkward teenager phase of its lifecycle, this year’s CMW felt like a teenager with a drivers’ license and a sudden interest in cosmetics. I don’t know what the collective spend was among the various content marketing software companies to be a part of the event, but it was no doubt considerable. And in the vast majority of cases, being able to put on a big show was possible not due to the accumulation of monthly recurring revenue (MRR) that is the lifeblood of software-as-a-service (SAAS) businesses, but due to venture capital funding. Angels and VCs paid for the Content Marketing World vendor expo, not the customers of the exhibiting companies. Of course, this isn’t 100% true, as there were a small handful of companies in attendance that have bootstrapped all the way, and the big, big guys like SAP can pay for a small trade show presence (comparatively, for them) with the money out of the soda machine at headquarters. And there’s nothing inherently wrong with using venture capital financing to do a show like that one. It doesn’t take a piercing insight into customer segmentation to discern that being part of a 2,500-person conference called Content Marketing World might be a viable tactic for a content marketing software concern. But I will be highly intrigued to see what the vendor area looks like in 2015 and 2016, because the VCs funding the content marketing software boom are chasing a bubble that may not actually exist. I haven’t run the analysis, and I probably should when I get some time, but I would be willing to wager that most of the VCs that are backing content marketing software did not back the most recent comparable SAAS run up (a.k.a. social media marketing software). They missed out on the prior frenzy, and are going to make damn sure they don’t get left at the dock again. There was a lot of talk at this event about content being the umbrella marketing initiative, with social media being just one form of content marketing. (It’s fascinating to see how that narrative flips at social media conferences, or word-of-mouth events for that matter. Everyone wants to be the parent, nobody wants to be the child). I’m not entirely certain where my current beliefs lie on that continuum, nor am I convinced that it’s a particularly productive or worthwhile debate. But I do believe that even if content is the parent of social media, there is a lot less money to collectively be made in content marketing software than there is in social media software. In hallway discussions with some very smart content marketers and businesspeople this week, conversations often turned to the exhibit hall and the fact that so many companies were going big when in truth their actual revenue remains quite small. In face-to-face conversations I always ask content marketing software companies (and pretty much any SAAS outfit) how many paying customers they have at that moment, and replies of “25” “42” “17” “125” and similar were almost universal at this event. In a vacuum, that is troubling. Of course, most of these companies are quite young, the market itself is only beginning to coalesce, customers don’t really even know what’s out there or what they might need by way of software, and so forth. All of that is true. Growth will come. But how much, and from whom? The overwhelming majority of these content marketing outfits are trying to target the same FORTUNE 1000 customer base. The good news about that market segment is that they have a lot of money, but the bad news is that there are only 1,000 potential customers in that cohort. As a category, content marketing software is manifestly suitable for its target audience. Despite being too young to shave, these companies have built elegant, stable, thoughtful packages that solve the pain points of big companies looking to create or curate more and more and more content, much of it hyper-targeted and/or real-time. Being great at content marketing isn’t easy, but this generation of software makes it look doable, and that’s no small feat. But is there enough of a market to support all of that software, especially with many providers offering strikingly similar features? Yes, it’s a question that has impacted the social media software business as well, but there are key differences between the two sectors. Social media is rooted in customers talking to companies, and enabling companies to talk back. That puts social media squarely at the cross-section of marketing and customer service. It also means that social media impacts EVERY business, even very small ones whose fortunes can be impacted by a bad string of Yelp reviews and similar. Businesses of all types and sizes and descriptions needs social media software to interact with customers, the same way they once had to purchase telephones to accomplish a similar objective. And to meet that need, there is an entire armada of social media marketing, and social media management, and social listening solutions available at all price points. From Sprinklr at the enterprise level, to Sprout Social (a sponsor of my JayToday videos) at the mid-to-enterprise level, to Buffer (I’m an investor) at the small-to-mid level, you can somewhat easily find the right flavor of social media software for your business. But with content marketing software, I don’t believe the same dynamics are at work. I can absolutely see how and why large companies need SAAS solutions to help them create and govern software. Our consulting team at Convince & Convert does a ton of content marketing strategy consulting, and routinely recommends software solutions to large companies. But is there a SMB customer base for content marketing software? I don’t think so today, or if there is, the content marketing industry hasn’t successfully made the case for it yet. As mentioned, today’s content marketing software is good. Better than it should be at this stage, really. But does a medium-sized business or small business need a software license to help them curate, create, manage, and measure content marketing? Multiple vendors at Content Marketing World 2014 take the “our solution is way better than Excel” approach to pitching their calendaring solution, or similar. And while it may be accurate that Excel is an unlikely candidate for the Beloved Software Hall of Fame, it is also true that every business already has it, has already paid for it, and already knows how to use it. Content marketing software also share a challenge with social media software, CRM software, marketing automation software, and every related thing in that it is only half the solution…. Content marketing success is about the wizard, not the wand. You can buy the best software in the world, but if you don’t have smart, dedicated marketers to operate it, the outcome will be middling, at best. All modern marketing software (of any stripe) requires labor to make the magic happen. That makes the true cost of software ownership not just licensing and training costs, but salaries and benefits, too. It’s another reason why I’m not sure SMB will embrace content marketing with the same fervor as they have social media. Many of those companies have only recently finished swallowing the new software and personnel expenses needed to “get good” at social, and now they are expected to do it again with content marketing? A more likely scenario for those companies may be that they task their social teams with doing content as well. Are some content marketing software firms going to make it, and return capital to investors? I suspect so, especially the handful of enterprise-class providers that have strong enough sales teams to get big deals pushed across the finish line. But for the others, I believe this market will consolidate faster and fly lower overall than many may be hoping. I could be totally wrong, and predicting a consolidation and a shake out in a fast growth sector of the software business isn’t exactly soothsaying on the level of that World Cup Octopus, but that’s how I saw this year’s Content Marketing World.